My main NY resolution is that I’m thinking of changing the topic of my book. Last semester, I gave a few public talks on particle physics to mark the opening of the LHC at CERN (see ‘My Seminars’ tab for slides). More used to giving talks on the Big Bang, I couldn’t help noticing that it is definitely easier to explain the physics of the universe than the physics of the sub-atomic. Also, there seems to be that bit more interest in cosmology..I guess this is because the study of the origin of the universe has implications for religion and philosophy and so has a wide appeal. One thing that worries me is that some of the best science books for the public remain relatively unknown, not sure why this is. For example, I really enjoy the books of Paul Davies, but they are not as wide selling as they should be. 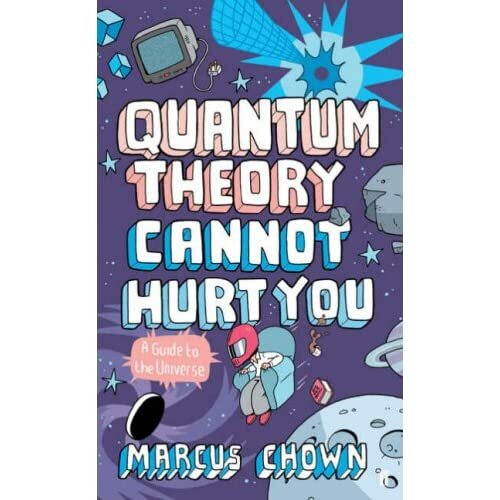 Another example is Marcus Chown – I read Quantum Theory Cannot Hurt You over Christmas , a really excellent book. Really good explanations of quantum physics, general relativity and whatnot, all with highly original analogies. Hmm..we’ll see. Delighted you liked my book! It’s great to have someone appreciate what I do – that I try to come up with my own pictures and analogies. Thanks again. And happy new year! If you liked “Quantum Theory Cannot Hurt You”, you might like “The Magic Furnace”(Vintage), which is my best-written book. Thanks for the link Dave. I must say, I found that review quite unstructured and a bit unsatisfactory…difficult to tell whether it is a good book or not from that review. First, there is far too much emphasis on the personal in the review ..does this reflect the book, one wonders. 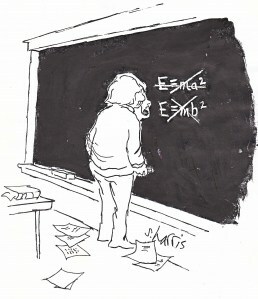 Second, it’s hard to tell whether Dirac’s scientific contribution is not well explained in the book, or whether the reviewer simply didn’t understand it..between antimatter, quantum field theory and the spin of the electron, Dirac’s contribution is a lot less abstract than many of his successors.. I suspect this is either a poor review of a good book, or possibly a poor review of a poor book! can u quantify that relatively or are you just putting spin on it..i’m sure that the subject matter was probably beyond the reviewer particularly if the subject himself was rather removed from commoner gardener reference points ..maybe its a modern complaint of looking for modern points of reference..the celebration of the self rather than the subject..
I’d give it +/- 1/2 marks for spin, and probably zero for gardening tips. It is a shame that Dirac is not better known by the general poplation. Only in the last month or so a statue to Maxwell was erected in Edinburgh much to the bewilderment of most of the general population. No doubt some of these people were outraged at this blatent waste of public money, and used their mobile phones to talk to their friends and local MPs to express their anger – ironic huh? Dave: you’re quite right – I too have noticed that reviews are more and more about the general opinions of the reviewer, and less about the book. For my money, Deutsch’s the fabric of reallity would be the best pop science book if you cut out that ridiculous last chapter. But still, is it the case? Thinking a little more about what you said, and the issues involved, this ties in with what I (and others) have come across, especially in my home country of the UK. To exaggerate the phenomenon: it would be a major faux-pas to admit to being ignorant of Shakespeare or dinning table etiquette, but confessing to being being rubbish at maths or science is not just acceptable, but something to be proud of. In recent years there have been some notable ground-breakers from the arty side: Melvyn Bragg and Steven Fry, for example, but not many. As you point out, now more than ever, the general population has to make choices and vote on important issues that require some degree of scientific knowledge (some of which you mentioned). How can they do this when they don’t know the difference between real science, CSI science, Hollywood film science, or the Koran (for a change), etc? If pop-science could change this then great – but, if string theory is widely condemned for not producing the goods in 20 years, then pop-science deserves much worse. criticism. Hawking’s book sold millions of copies and graced thousands of coffee tables. But how often was it opened, and more importantly: was it read? (Sure, all pop-science books are read by many other scientists, and this produces lots of reviews ranging accross the whole spectrum of appreciation :-) , but that’s just preaching to the choir – what about the intended ‘lay’ audience?). It was published in 1988. Perhaps you were teaching around that time? Did you find a sudden increase in the cosmic background understanding of science then? I think the book (in the eyes of the general polulation) was just another ‘trophy’ of the 80’s era. In those days you could buy yourself anything: style, friends, influence, flashy cars, and now! look! you can buy instant intellectual kudos at $8.00 from the book store (but be sure to display it on that expensive coffee table). Kids like anything that is shiny, moves, or makes funny noises, so you can’t draw conclusions from that. They could still all end up being scientologists. Was I teaching around that time? Excusez moi. How old d’ya think I am? I hadn’t even started postgrad. He’s banging, performed alongside chart-toppers like Tinchy Stryder and Chpimunk.